Trolls, bots, and memes become parents’ new nightmare. So what’s the solution? A friend recently asked me if someone should be putting together a source for parents who have to address so much in the lives of their digital natives. I have a few go-to websites that we use as teachers, but was struggling to find a good hand book. First two of the best web-based resources I recommend. COMMON SENSE MEDIA – This is a wonderful, deep trove of information that is updated with plenty of topics (plus short videos) on such from phone addiction, and fake news, to privacy tips and how to navigate the difficult world of plagiarism, copyright, password protection, oversharing etc. EDUTOPIA – Another great place for articles on technology skills such as coding, academic skills being taught such as note-taking, problem-solving, state standards, digital citizenship etc. But the reality is that almost every week, children are bombarded and confused by new issues. One week it’s plagiarism, the next it is memes, and add to that the constant misinformation through bots and trolls, followed by the news related to cyber-bullying or inappropriate behavior that pops up on TV or their social media feeds. The search engines and social media platforms are often gamed by bots, and tricked by pranksters, but who has time to inform the kids about these fast-moving events? So the sad thing, as I had to tell my friend, was there is no handbook. Just like there was no user-guide when we first got onto the early Internet. However that Internet was a place we went to, consciously logging in to it, or “dialing up” to it. Today, that place isn’t somewhere we visit – it visits us. Students who grow up with it have to navigate it on their own. It’s like giving them the keys to the car, before they go to driving school, expecting things to be alright on the road. But of course there is one user-guide. It’s unpublished. It’s called Parenting. 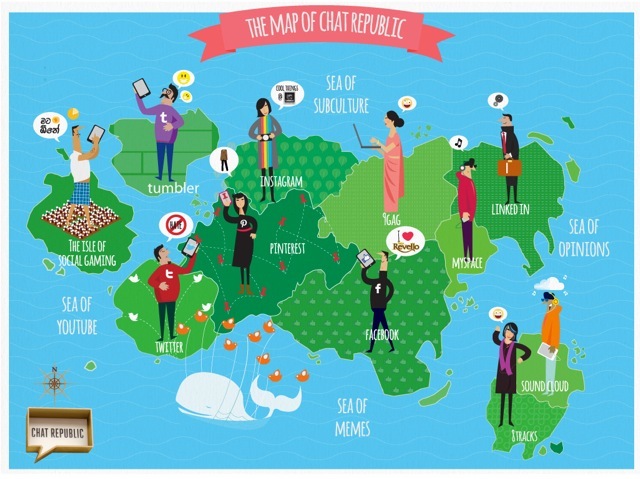 Here’s something that’s being used to promote the Round Table discussion around Chat Republic.